It is found that the threshold for blast-induced neurotrauma documented from previous experiments in animals and cell cultures is approximately given by the criterion that the shock thickness be comparable to the characteristic dimension of a neuron cell (approximately 20 μm). The coincidence of the shock thickness with the characteristic dimension of the neuron cells supports the view that cell damage may be related to the localized mechanical deformation of cell components and shear for sufficiently strong and thin shocks. 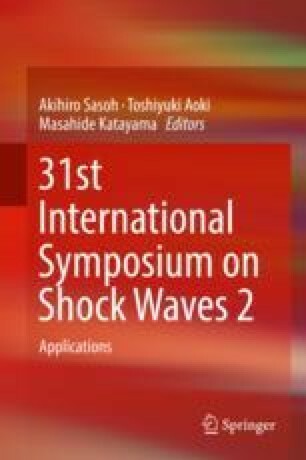 Our estimate of the shock wave thickness in biological material is based on the weak shock model of Thompson extended to materials whose compressibility can be modeled using the stiffened gas equation of state. Simulations of the transient relaxation of step function shocks into the steady shock profiles provided the time scale for the shock thickening when an impact-generated shock or much thinner air shock enters the biomaterial modeled. We find that air shocks will always be more damaging than those propagating through water at the same pressure level, consistent with experiment.